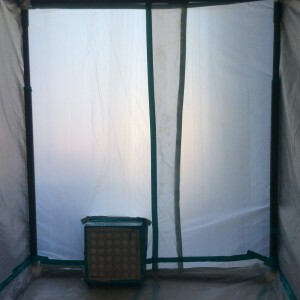 Containment set up during an asbestos abatement project to protect the rest of the home from dangerous asbestos fibers. Asbestos is commonly found in homes built before the mid 1980’s. In the past, asbestos was renowned for its fiber strength and flame retardant properties and as a result was incorporated into many building materials like insulation, tiling and roofing. Today, asbestos products have been banned and we know that the inhalation of asbestos fibers can be responsible for breathing problems, mesothelioma, asbestosis, and other deadly diseases. When asbestos-containing materials are damaged or disturbed, asbestos fibers are released into the air of your home or business putting you, your employees and your family at risk for health problems. This is why during deconstruction and remodeling in older homes it is important to consider an asbestos inspection. With asbestos abatement it is important to have a trustworthy, experienced and properly licensed contractor to properly identify, isolate, contain, and then remove the asbestos from your building. KIC Restoration is a State of California ASB licensed contractor that can help you throughout the entire process of asbestos removal. From initial testing of the suspect building material to a final air clearance upon completion, we have you covered. First, we will test the specified area. If asbestos is found, we will contain the area so that asbestos fibers are not spread, thus protecting your home or workplace. Then we will proceed with the asbestos abatement outlined by State and Federal guidelines. Once we have completed the asbestos removal, we will test for the presence asbestos again to ensure that KIC Restoration will leave you and your building completely asbestos-free. 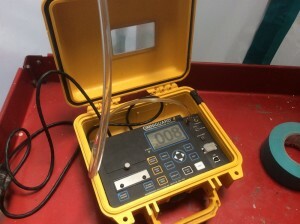 Negative air containment monitoring for asbestos abatement in a hospital setting. Do I have to hire a licensed contractor? Yes. When you find building materials that may be prone to asbestos, do not take any chances. Do not settle for quick and cheap fixes for asbestos—this will not eliminate the threat and could possibly worsen the issue. Simply removing the asbestos-containing materials will not solve your problem, it will most likely only release asbestos fibers into your building, putting your health at an even greater risk. Asbestos is considered a hazardous material and is required by law to be removed by a licensed professional. KIC Restoration has the license and the experience to ensure that your asbestos is removed the right way: safely and thoroughly. Do not take a risk with your health—call KIC Restoration for asbestos abatement in San Diego.